This is my 2nd ZG. 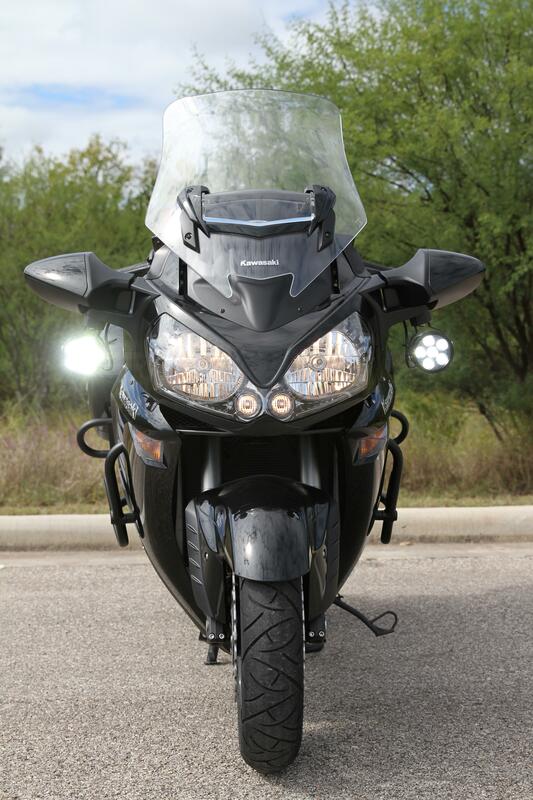 I had a 2008 ZG1400 that came with a dedicated 12v, unswitched lead tucked inside the right lower fairing. It was perfect for plugging in a "Battery Tender". My 2016 no longer has this lead. It has the standard 12v cig lighter socket and 2 12v accessory leads, one under the left fairing cowl cover and one under the seat latch if you remove the seat. The leads on the left fairing are switched as is the 12v socket. These don't work for the "Battery Tender because they are "switched". I have not found the 12v leads underneath the seat latch so I wired leads/plug directly from the battery. This lead set comes with a Deltran Battery Tender but I have to pack-it-in to that tight battery compartment. Unfortunately the plug is not easily accessible unless I leave the plug hanging down from the top plastic cover of the battery compartment. I'm good with that because I'm not splicing into anything. Does anyone know if the rear seat latch set in unswitched? Does anyone have a cool idea regarding a battery tender? This may work on other fuseblocks??? It does on the Eastern Beaver 3 CS (3 circuit solution) I went with. He offers this in all switched or 2 switched and one unswitched. Went with the 2 and 1 so now I connected a tender lead to the unswitched circuit and this will charge battery. Have had tender connected and all is good. For some a 3 circuit isn't enough but after years of having 6's and 8's and only utilizing 4 at the most circuits I am satisfied. I installed a separate fuse block direct connected to the battery for my battery tender. I quickly found I wanted more than just the battery tender. The battery in this bike does NOT permit more than one connection to the battery with the stock battery terminal screws. Theres simply not enough room. The accessory leads are under the front left near the glovebox, and the rear tail section under the rack location. I went direct to the battery with 8G wire. I'm back home and ready to search for the rear, tail section leads. I'm somewhat surprised that KAW doesn't run unswitched power in any harness section for accessory access. I don't mind the DELTRAN harness setup except that the plug has to be stowed behind top cover and that cover needs to be removed to connect plug or I can modify the bottom of that cover allowing the plug hang externally. I can figure something out. I'm liking an addt'l fuse block scenario, using one power wire from battery to where ever one chooses. I'm curious what you all use accessory-wise to require more than 2 power connectors. I use USB from 12v cig adapter to power GPS and phone as one and the (glovebox) accessory connector as an additional. I'm not surprised at all. It eliminates problems at dealerships and battery/wiring overloading and draining. Key off, no draws but what they want. Read through the thread I posted. It answers most of your questions. ..and I have a couple more slots if I decide something else. All these items need direct to battery connection. You can't do this all in the battery compartment. Not enough room. I don't use the CIG plug but I have a harness to do so if needed. My GPS is wired to the accessory harness. I had my battery tender there initially where you do, But the battery cover is a PITA. Now, mine comes out near the right rear footpeg and I dont gotta take the seat off or fiddle with battery compartment. My battery tender plug also hang just above the footpeg. It's been there for 52k miles and no issues. That link JTX provided is pretty thorough. You'll see why some need 6 accessory leads. I have my tender dangling as well. Didn't want it like that but in the end it's not ugly or noticeable and the tender 'end cover plug' helps the thing blend in and keeps the inside nice and clean. If you want a clean install and are wiring to the left dash lead maybe use a grommet and run the tender into the side pocket glove box. I've thought about it if my OCD gets going but I am not crazy about rewiring something that works as is. On my KLR the tender is zip tied to the handlebars so it will never snap off from a stone or drop. Snapped a GPS cable like that once, in the middle of nowhere in a foreign country, long story lol. Since then I imagined mine in the glove box on the Connie. Running 2 things from the 12v cig socket can blow the tiny fuse. I use an iPhone and it draws a ton. There are double USB adapters where one thing will get less amps than the other. This has worked for me with an iPhone and GoPro plugged in. Before it would blow the fuse with those 2 at once. My adapter is GoPro brand. $20. Maybe your 2 items are low draw or you have an even better solution - just sayin'. Big Fan JTX! That is how I would do it. I'm impressed that the Concours can handle multiple 5/10a services simultaneously. I ride a KTM 990Adv and that's my "dualsport" ride but I ride it exclusively off-road. It has knobbies front and rear and it has one 12v cig adapter/5amp that I use for GPS charge and/or phone charge. I use heated grips from a factory access lead and I bluetooth music from phone to helmet. I carry a XP10 battery pack for emergency 12v. The cig adapter with USB is for charge applications only. With the exception of grips and charge cycles, all my aux systems are battery powered. I tender this bike direct from the cig adapter, it isn't switched. I ride my concours in a sport scenario vs touring. I go for considerable distances and I rely on KLIM apparel for rain and warmth. I've never used heated gloves, seat or outerwear. I don't know what else I would want electrical accessory-wise. Isn't there aux driving light electrical access as part of the wiring harness? Big Fan JTX! That is how I would do it. I'm impressed that the Concours can handle multiple 5/10a services. I ride my concours in a sport scenario vs touring. I go for considerable distances and I rely on KLIM apparel for rain and warmth. I've never used heated gloves, seat. I don't know what else I would want electrical accessory-wise. Isn't aux driving lights part of the wiring harness? Yeah so not your first rodeo as they say here in TX. Theres no factory wiring on the C14 that'll handle the power requirements of the Clearwater Erica LEDs that I have. The control module needs a direct battery connection and the C14 does not offer up any extra connection points. Only a 5 amp accessory harness. The off roading must be fun stuff out that way. I did some off road riding in Colorado on my trip out that way. Not that I WANTED to, but it just happened. I hear you on the Connie off-road stuff. I've ridden my 2008 all over the 2-lane dirt passes here in CO and I never had one hiccup. I didn't plan to do that either, it just happened! Multiple times! My avatar is Cottonwood Pass, 17miles form my home. Paved on one side, dirt on the other. 60mph on one side, 20mph on the other! LED lighting is my next "want" for the KTM and the ZG. I've heard that YUASA battery quality has improved greatly. I have a YTZ14S in the KTM and I believe the ZG has the YTZ14BS. I'm convinced that battery tendering is required if you want a battery to last 4+ years. You can see where I did my off road adventure here. Look at the CWL led's It's expensive, but IMO the best option with the best customer service/warranty you'll get. Yeah and even then, pushing it past 4 years, is really just not nessisary. A good quality battery is around $100 and is a lot cheaper than waiting for tow truck service and the inconvenience of relying on some bubba ( no offense to bubba ) in a random state where you have to wait 24 hrs to get a battery. I got two years left on my battery, and off it goes. I can re-purpose it here for an electronics project. My new YTZ14S is $140 from Amazon. I replaced the 3year YTZ that was OEM with the KTM. The old battery still has 12.56v after sitting on the shelf in the garage for a month. It was "tendered" since new. Sometimes I ride solo and I don't want battery issues off-road. I'm the same, 2-3years is my norm. Thanks for your tech pic's and input. I appreciate the info.. I discovered the tail section accessory leads. They are "switched as well". So I've installed plugs at the front left fairing and the rear tail should I need 12v. I don't know why the pics are rotated 90deg out!!!??? THE MAP YOU PROVIDED, WESTERN CO IS MY BACKYARD. You even mention "27 south to Masonville"... passing through Estes Park via 34 to 36". That's STOVE PRAIRIE ROAD and I rode that area a lot. Trail Ridge trough Rocky Mountain National Park has always been awesome. Very, very crowded now, but awesome! If you ever come back to CO, let me know. Yikes, I haven't looked for batteries in a while so I hope prices arent going up. u even mention "27 south to Masonville"... passing through Estes Park via 34 to 36". That's STOVE PRAIRIE ROAD and I rode that area a lot. Trail Ridge trough Rocky Mountain National Park has always been awesome. Very, very crowded now, but awesome! 14 was a ZOO. I bet I droned along for half hour behind 15 dingalings all going 30mph down 14. Once I got to 27, I was happy to get out of second gear! I assume this is not you. 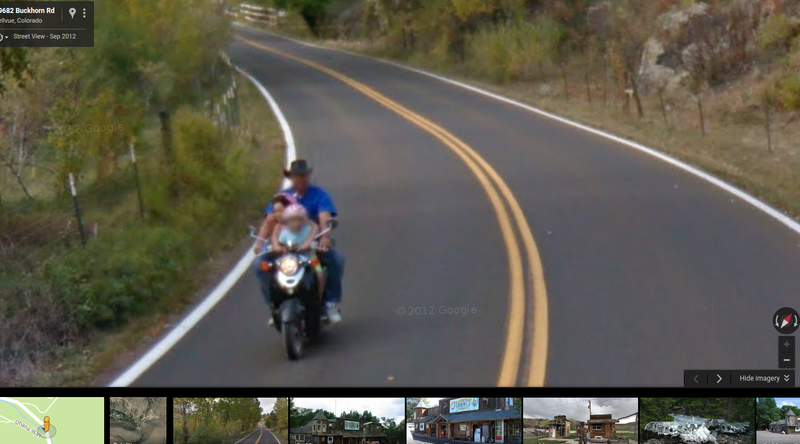 I was zooming into the road to jogg my memory and see this clown with his two grand kids or something. Some people just dont use their dam heads. Speaking of using your head - do you have a dimmer knob on those Hubble LEDs? I'm sure you do you seem like a smart guy. Should be the law with those. There are guys in my bmw club who have them and just switch them on and off when they see fit. I won't ride with them bc they have ppl turning around on them yelling at them about seeing stars and spots. I imagine they'll get dimmers or their lights or heads bashed in one day. Well, staring into the lights is not very smart, either. But yes the low setting is pretty tame. Any 'bashing' attempts will result in lead poisoning . What your describing is a bit of vigilante in nature dontcha think? Call the police if you think someone is doing something wrong. I have no sympathy for road ragers. And like I said, anyone chasing me down because of a bright LED light to ' do something about it ' is likely biting off more than they are expecting and its not too 'bright' in of itself if they get silly. But no, I don't run them on high power during the day, either. Never said anything about vigilante behavior. We are all carrying in TN so the discussions were tame and valid. 'Dude, you are blinding people with those we almost wrecked' seemed reasonable to tell someone in case they didn't know it. But, have the same guy blind you a few times and who knows. You're awful defensive. I don't believe you have a dimmer. So in your world, turning around, chasing someone down and making a scene in the middle of the highway is the correct answer. We dont agree. A simple HI flash with your own Lights would suffice if you felt the need. Move on with your life. I dont care what you believe. Apparently you've never seen the hardware used for these LED's or how they operate or you'd know they have an adjustment dial. Who said they made a scene? Was perfectly reasonable. Apparently you've never been blinded. Page created in 1.065 seconds with 25 queries.